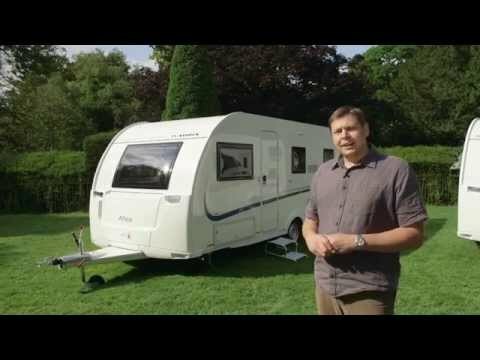 Get inside the new for 2015 Adria Altea 552DT Tamar with Practical Caravan's Group Editor Alastair Clements in our video review. And let us know what you think! Please like, comment, share and enjoy. Adria is the only Continental manufacturer to build caravans for the UK market, with the door on the nearside. The Slovenian company's ambitious plans to expand British sales will hinge on the success of this entry-level model, new for 2015. The reworked Altea follows the 2014 model year makeovers for the Adora and Astella, and like the mid-market Adora, the Altea now uses Adria’s ‘i-Shape’ exterior design with a curving rear roofline to improve fuel consumption on tow. The sidewalls are dent-resistant polyester, with modular plastic panels front and rear to make smaller bumps on Adria caravans cheap and easy to repair. Adria believes that the traditional nuclear family is no more, so its layouts need to be flexible and responsive. The result is caravans such as this Tamar, one of two six-berth options in the four-model Altea range. The Adria logo has been redesigned for 2015 to mark the firm’s 50th anniversary and it appears here in a 3D style, but elsewhere it’s clear that this is a budget model with its plain sidewalls, no sunroof and steel wheels. This hitch is pretty bare, too, with no anti-snaking device, though for the UK market it will come with an AKS stabiliser as part of the standard ‘Golden Anniversary’ pack – along with Truma Ultraheat, a drainer and a sink cover. There is external access to the under-bunk storage up front, but an unfortunate result of the nearside washroom is that you’ll have to take the toilet cassette out through the awning when you want to empty it. Unlike the majority of the British brands, the Adria Altea 552DT Tamar doesn’t have a central chest. Instead there’s a rather flimsy flap of a table, which is better folded away so that you can make the most of the spacious lounge area, which comfortably seats five. The freestanding table is handily placed in a locker just aft of the sofa. The ‘Autumn leaves’ soft furnishings in this Adria are new and feel modern, as does the whole interior design with its hidden catches and unadorned cabinetwork. However, it would have been nice to have a bit more light: this front window isn’t enormous, and the Altea does without the Adora’s large opening sunroof – even as an option. The cooking area in the Altea 552DT Tamar now follows Adria’s ‘SMART’ philosophy. Instead of the traditional UK layout with a hob/oven/grill combination, there’s a combined oven and grill sensibly sited at chest level, to the left of a three-burner hob with its rings in a line rather than in a cluster. It’s designed to be a better fit for multiple pans, and on the whole works well – though the left-hand controls are awkward if you’re right-handed. We love the massive drawers beneath: they’re far more useful than a tiny storage space and are much more domestic in feel, while their soft-close runners are a classy touch in a budget tourer. There’s a huge cupboard above, too, but there is no microwave and preparation space is limited, though you can always employ the dinette table sited opposite. The only part of this caravan that doesn’t feel spacious is the washroom, but Adria feels that its clever ‘ERGO’ design makes the most of the room available. While that’s true to a certain extent – the drop-down sink is a nifty touch, there’s a surprisingly big bathroom cabinet and the mirror finish gives an impression of space – it’s still fairly limited. We like the stylish fittings, but the curving rear roofline prevents taller users from standing up straight in the shower – and we’d have preferred a fully lined cubicle. The Adria Altea 552DT Tamar is all about its sleeping options. First, there’s a good front double, formed by sliding out the slats from beneath the sofa cushions – which can be awkward because there are no support struts for the bed-box covers. Next there’s the offside dinette, which makes a lower bunk by dropping the table, while the upper berth folds out from the wall. It’s easy enough to do, and ideal for occasional guests during your caravan holidays. Finally, at the back there are two fixed bunks that are usefully long so can be used by adults, or are ideal for kids and teens with their fun reading lights. If you’re likely to be touring with lots of children, you can even specify a third bunk for an extra £295, making this a seven-berth van. There are no complaints about the storage options in this van, though, as the Practical Caravan Adria Altea 552DT Tamar review revealed. Between the bunks and washroom at the back – above the Truma 3004 heater – there’s a whopping wardrobe, while along the sides and at the front there is a multitude of generous overhead and under-bunk lockers. The pale timber-effect finish feels very Scandinavian, with no handles but instead neat push catches for all of the lockers. The Adria Altea 552DT Tamar is a tourer that splits opinion. It’s unlikely to appeal to a traditional British buyer seeking home comforts and a little bit of luxury on their caravan holidays, but for those who are looking for something a bit different it has plenty of appeal. It’s a big van for a start, and its clever space optimisation and value for money make it an interesting alternative for those who appreciate its no-nonsense design.